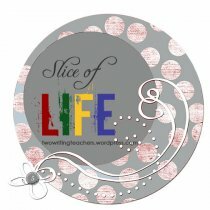 Get In On The "Slice of Life" Challenge! It's not too late to start, right? Only one day late! Yep, I'm also going to take on the 2012 Slice of Life Challenge (read more at http://twowritingteachers.wordpress.com/): to write every day for 31 days in a row. Whether or not I'll post all I write will remain to be seen. Sometimes I feel like sharing, seeking response...putting the thoughts out there...frequently I write just to write--to calm my mind, examine my thoughts, figure something out. No matter what, writing is always worth undertaking. Always. A good friend of mine (who happened to complete her student-teaching in my second grade classroom many, many years ago) posted about writing a Classroom Constitution recently with her students. She shared how one student said they should include, "Never miss a day in your writing life!" This is a classroom mantra I love, and one year, a student of mine included it in a letter to his parents at the end of the year. YES! What success! Every day we should work to help our students see, feel, experience, and reflect on the joys and benefits of writing (no matter what standard we are working on!!!). So, here's to writing! And, here's to the "Slice of Life Challenge!" Yipee! I'm glad you are joining us. And, as far as I'm concerned, it's never too late to start writing. So true! Happy to be part of the effort!